The home base of Portland Creek Outfitters is Portland Creek, on the Northern Peninsula of Newfoundland, Canada. All of Newfoundland, and especially the Northern Peninsula is well know for it's big game hunting and angler fishing. Portland Creek Outfitters can help you be a part of it. Portland Creek Outfitters is owned and operated by Leonard Payne and his daughter Shelley and his son, Guy. The company has been in operation since 1992 and both Shelley and Guy have grown with the operation. 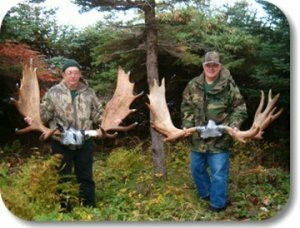 With 9 camps located in Northern Newfoundland and Labrador, a variety of locations are available for potential hunters. Portland Creek Outfitters are the owners of two float planes. One of them is a Cessna 185 and the other is a Beaver. This is a very convenient service, allowing Portland Creek Outfitters to provide a service to hunters that is second to none. Portland Creek Outfitters believes that the key to their success is their guides. Guides are the key to hunters having a very success hunt. Experienced professional guides will work hard each day to ensure that hunters get their game. If bow hunting is for you, guides with bow hunting experience are available. Guides are very dedicated to their work and to making your hunting trip an enjoyable and memorable one - the trip of a lifetime. All camps of Portland Creek Outfitters have a cook who will make sure that all hunters are well taken care of. All camps have cooking and guide quarters which are separate from hunting quarters. Expect a hospitality from cooks that is second to none.